Welcome to Pink-Forever a fansite dedicated to the lovely musician, P!nk. You might have seen P!nk on her latest Truth About Love Tour. Or heard her number one hits such as Get the Party Started, Just Like A Pill, Blow Me One (Last Kiss) to her Grammy nominated hit Just Give Me A Reason Here on Pink-Forever we provide fans with latest news, gossip, photos, videos, and much more! All photos are copyrighted to their respectful owners unless stated otherwise so there is no copyrighted infringement intended. Please bookmark us and visit again soon! Here’s what she says she is doing: pruning vines, picking grapes, bottling wines by hand. Taking wine courses through the Wine & Spirit Education Trust and UCLA Extension. Visiting wineries sheadmires around the world — Chateau Pontet-Canet, Clos Rougeard, Antica Terra. Asking lots of questions of Melville and other winemakers around Santa Barbara County. And yes, in her spare time she’s on the road performing the 128 shows of her 14-month-long Beautiful Trauma” tour. 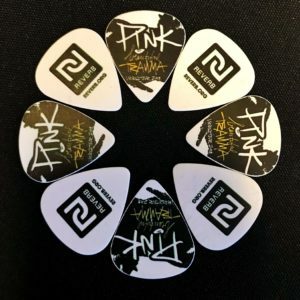 REVERB AND P!NK TEAMED UP TO CREATE A CUSTOM PROGRAM THAT SUPPORTS HER WORK WITH NONPROFIT PARTNERS WHILE REDUCING THE ENVIRONMENTAL IMPACT OF HER TOUR. In 2018, P!nk and REVERB partnered together on the Beautiful Trauma Tour to accomplish three things: support her work with UNICEF and No Kid Hungry, reduce the environmental footprint of the tour, and empower her fans to take action for both. P!nk was introduced to REVERB after collaborating with our longtime artist partner Nate Ruess on the hit song, “Just Give Me a Reason.” Nate, having been a REVERB partner both as a solo artist and as a member of FUN., was very familiar with our work and suggested we connect to create a tour program for P!nk’s upcoming tour. 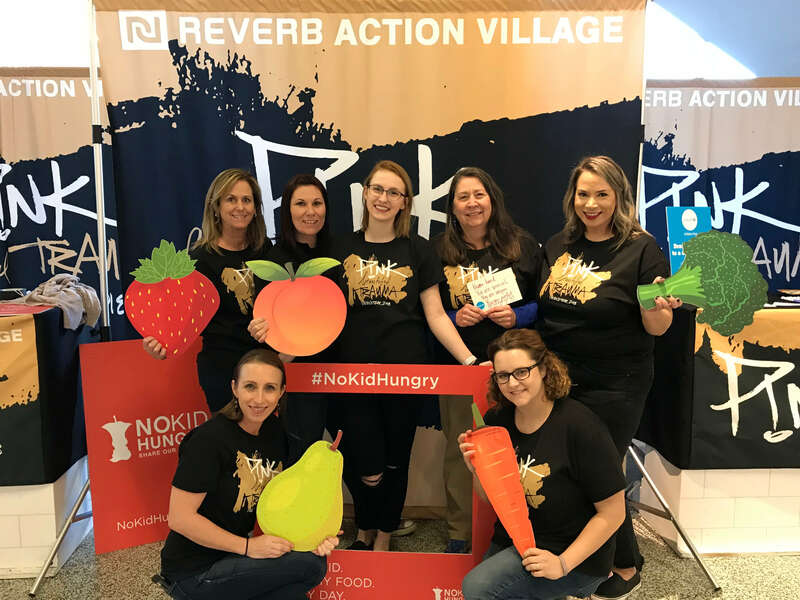 After working closely with P!nk and her management team, REVERB created the Beautiful Trauma Action Village – an interactive space set up on the main concourse at every show by REVERB’s on-site tour coordinator and brought to life by REVERB volunteers. The Action Village empowers fans to learn more about P!nk’s work with UNICEF and No Kid Hungry and also take direct action for both organizations in a fun, positive space. 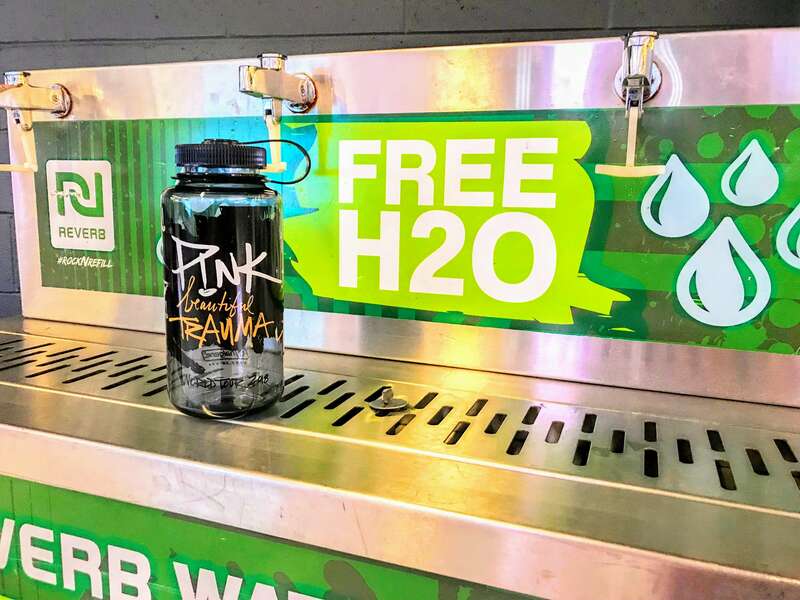 Fans were also invited to reduce their environmental footprint by using REVERB’s free water refill stations and donate for a custom P!nk Nalgene bottle through the #RockNRefill program. 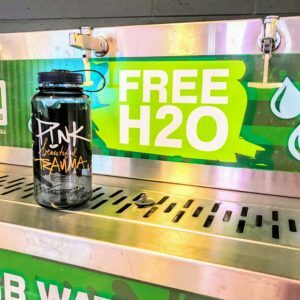 REVERB also created a comprehensive greening program that allowed P!nk and her crew to reduce the need for single-use plastic water bottles backstage, eat fresh produce from local farms each night, and incorporated eco-friendly products backstage and on tour buses. 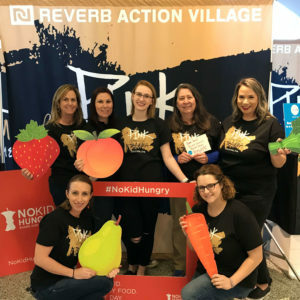 P!NK AND HER FANS WORKED WITH REVERB TO SUPPORT UNICEF AND NO KID HUNGRY AND REDUCE THE ENVIRONMENTAL FOOTPRINT OF THE BEAUTIFUL TRAUMA TOUR. The first leg of P!nk’s tour was a huge success! Across 46 shows, P!nk, her band and crew, and her incredible fans worked with REVERB to create a huge impact for people and the planet. 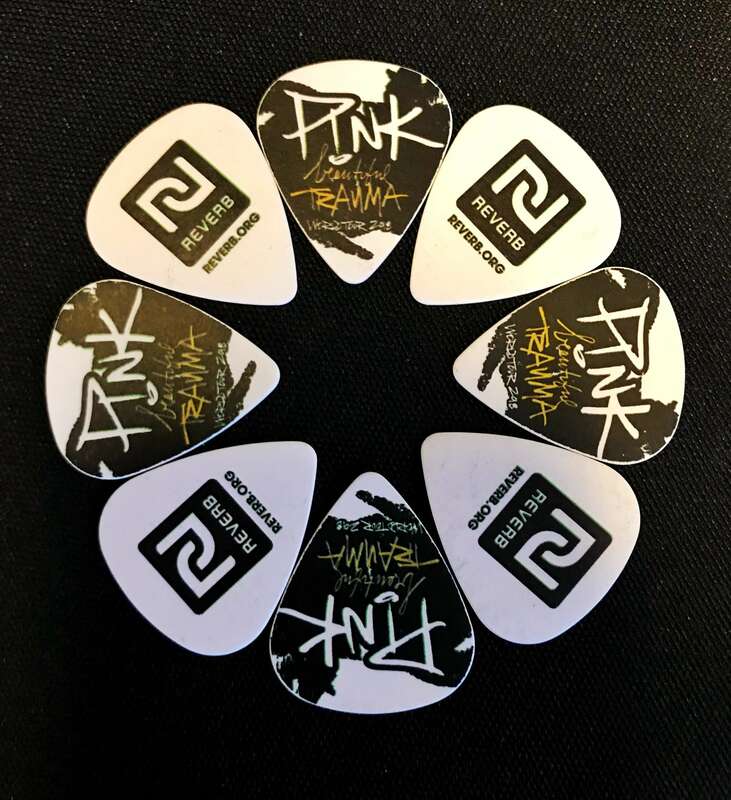 We were so proud to work with P!nk on the Beautiful Trauma Tour and meet so many of her amazing fans! With her schedule of nine shows, the longest run of shows ever for a solo artist at the venue, P!NK has smashed the ticket sales record at Sydney’s Qudos Bank Arena, with her Beautiful Trauma World Tour that wrapped up on Wednesday. P!NK, along with promoter, Live Nation and artist manager, Roger Davies now hold the record for the highest ticket sales of any artist, group or otherwise, to play Qudos Bank Arena, with a total of 143,367 tickets sold across nine performances – surpassing the previous record holder by more than 50%. To celebrate the milestone, Qudos Bank Arena’s General Manager Steve Hevern and AEG Group Director of Arenas Tim Worton presented P!NK with two Indian Chieftain Motorcycle fuel tanks that were custom painted, one themed in the Beautiful Trauma World Tour artwork and the other themed with Australia’s most famous bushranger, Ned Kelly – to suit the Indian motorcycles that both P!NK and her husband Carey Hart ride. Two large murals, were also commissioned by Street Artist Mr. G to commemorate the occasion – one located back of house (for bragging rights) and the other in the front of house area on Level 3 for everyone to enjoy. Fans travelled far and wide to experience the concerts, briefly interrupted by the star’s illness, before she resumed her high energy performances at rescheduled dates. Qudos Bank Arena’s General Manager Steve Hevern said “it is an amazing number of tickets sold by an amazing artist, and it’s a record that I believe will stand for a very long time. P!NK’s performance on the 4th August during this tour in particular was one of the gutsiest I have seen, as she was clearly still not 100% after being unwell, but managed to give her all and perform magnificently. “We are forever grateful to P!NK for returning to perform the rescheduled shows after having overcome her illnesses and so very proud to have her hold our attendance record and have her name indelibly etched in our history”. After performing an insane 35 arena shows during her 2019 Australian Tour amid a series of hospitalisations, it’s safe to say P!nk has definitely worked up a hard-earned thirst. And it turns out she loves VB just as much as her Aussie fans do. In fact, after spying an Instagram post of the so-what-I’m-still-a-rockstar popstar knocking back a few green boys during her all-Aussie adventures, Victoria Bitter brewers Carlton United breweries decided to reward her for her support with a slab of customised stubbies, complete with pink packaging and the artist’s Funhouse tag. “Pink works bloody hard on tour so it’s no surprise she works up a hard earned thirst,” a CUB spokesperson confirms to The Music. “We were stoked last month (but not surprised) when she posted on Instagram that she was knocking off with an ice cold VB in Australia. We wanted to thank her. Not only for supporting us but for fulfilling her commitments to Aussie fans after being hospitalised mid-tour. Many other musicians would have pulled the pin. But she returned to the country to give people what they’d paid for. What a legend. P!nk out on Auckland’s Ponsonby Road with Carey Hart and Willow. They browsed in a book shop and then stopped for lunch at Ponsonby Central. P!nk enjoys a day out in Auckland with her family. They walked from their hotel to the waterfront area, where they stopped for a meal. Pink-Forever is an unofficial fansite, made by a fan for other fans of P!nk to enjoy. We're not affiliated with P!nk, her family or her management team. No profits are made through our fansite. No copyright infringement is intended. Pictures and media are copyrighted to their respective owners. If you're the owner of any content on our website and wish to have them removed please email us at contact@pink-forever.ca before taking legal action. Theme by DC Design @ 2019 - Pink-Forever.ca.